8 civilians were killed in the West Bank and Gaza Strip. Among the killed was a Jordanian person, who was killed in occupied Jerusalem, and 5 children. 13 civilians, including 4 children, were wounded in the Gaza Strip and West Bank. Israeli warplanes carried out 3 airstrikes on the Gaza Strip, due to which 2 agricultural rooms and a water well were destroyed. Israeli forces targeted the border area along in the northern Gaza Strip and wounded a farmer. Israeli forces conducted 116 incursions into Palestinian communities in the West Bank and 2 limited ones in the southern Gaza Strip. 110 civilians, including 31 children and a woman, were arrested. 33 of them, including 12 children and the woman, were arrested in occupied Jerusalem. A Palestinian civilian was obliged to self-demolish his house while another house was demolished in Beit Hanina neighbourhood. A house was vacated for the interest of a settlement organization in the Old City. Settlers set fire to 13 olive trees, east of Qalqilya. A fisherman was wounded and his boat sustained material damage in the northern Gaza Strip. 6 fishermen were arrested off Deir al-Balah shore and their boat was confiscated. 4 Palestinian civilians were arrested at military checkpoints. A businessman was arrested at Beit Hanoun (Erez) crossing. Israeli violations of international law and international humanitarian law in the oPt continued during the reporting period (08 – 21 September 2016). Israeli forces have continued to commit crimes, inflicting civilian casualties. They have also continued to use excessive force against Palestinian civilians participating in peaceful protests in the West Bank and Gaza Strip, the majority of whom were youngsters. During the reporting period, Israeli forces killed 8 civilians, including 5 children and a Jordanian person, in the West Bank and Gaza Strip. They also wounded 15 others, including 4 children. Eleven of them were in the West Bank, including 2 girls, while the 4 others were in the Gaza Strip. In the Gaza Strip, Israeli navy forces continued to target Palestinian fishermen and chase them in the sea, while Israeli land troops continued to target the border area. In addition, Israeli warplanes carried out 3 airstrikes in Gaza. On 16 September 2016, Israeli forces killed a Jordanian civilian while walking in al-Amoud Gate area in East Jerusalem’s Old City under the pretext that he attempted to stab an Israeli soldier. It should be noted the killed used to work in the Jordanian Water Authority and he was in a visit to Jerusalem along with a tourist group that entered the Palestinian territory via al-Karamah crossing one day before he was killed. On the same day, Israeli forces stationed at the entrance of “Givat Kharsina” settlement, east of Hebron, opened fire at a vehicle under the pretext of a run-over attack. As a result, the driver named Feras al-Khdour (17) was killed and his relative Raghad (16) was wounded. They are both from Bani Na’im village, east of Hebron. The aforementioned girl was transported to Hadassa Hospital in Jerusalem by an Israeli military ambulance while the corpse of Feras was kept in custody. On the same day also, Israeli forces stationed at Gilbert military checkpoint, north of Tal al-Rumaida neighbourhood, in the centre of Hebron, opened fire at Mohammed Thalji Rajabi (15) and killed him. Israeli forces claimed that Mohammed attempted to carry out a stabbing. The forces summoned the killed person’s father to military checkpoint (160), south of the city, where he was informed of the death of his son. On 17 September 2016, Israeli forces stationed at the closed area between al-Rahma Mount and Tal al-Rumaida neighbourhood, in the centre of Hebron, opened fire at Hatem al-Shaloudi (25), whose house is only 20 meters away from the scene. As a result, he was killed and his corpse was kept in custody for 2 hours until a military vehicle transported him to an unknown destination. Afterwards, Israeli media published a video clip of the aforementioned person attacking an Israeli soldier with a sharp tool. On 19 September 2016, Israeli Border Guard officers stationed in a surveillance and search room in Ein al-Hamrah area, south of the Ibrahimi mosque, south of Hebron’s Old City, opened fire at Amir Rajabi (17) and Mohammed Rajabi (22). As a result, the child was killed and the other civilians was seriously wounded. The wounded person was transported half an hour later by an ambulance, but he was pronounced dead an hour following his injury. Israeli forces claimed that the 2 aforementioned persons attempted to carry out a stabbing. On 20 September 2016, Israeli forces that established a temporary checkpoint at the entrance to Bani Na’im village, east of Hebron, opened fire at Essa Tarayra (16), from the said village, while walking towards the checkpoint. Israeli soldiers opened fire at him from a range of 30 meters and left him bleeding for about half an hour. He was then transported by an ambulance but he was pronounced dead later. Israeli forces claimed that Tarayra was holding a knife and attempted to carry out a stabbing. No eyewitnesses were there to confirm or reject the Israeli story. On 12 September 2016, Israeli forces wounded 4 Palestinian civilians when former moved into al-Wa’ar area, east of Asirah village, southeast of Nablus. On 18 September 2016, Israeli forces opened fire at Baha’ al-Deen Ouda (20) under the pretext that he attempted to stab an Israeli officer at the entrance to “Efrat” settlement, south of Bethlehem. As a result, Ouda sustained several bullet wounds and was then transported to Soroka Hospital in Beersheba to receive the necessary medical treatment. On 19 September 2016, Israeli forces opened fire at Ayman al-Kurd (20) after he stabbed 2 Israeli soldiers at al-Sahera Gate in East Jerusalem. As a result, he sustained several bullet wounds and was then transported to Hadassa Hospital. On 20 September 2016, 3 civilians were wounded when Israeli forces moved into al-Dheisha refugee camp, south of Bethlehem. On 21 September 2016, Israeli forces stationed at Jaljulia military checkpoint opened fire at Bara’a Owaisi (13), from Qalqilya. As a result, she sustained a bullet wound to the leg and was immediately arrested. The wounded girl was walking without listening to the soldiers’ shouts ordering her to stop. Israeli media confirmed that the girl did not attempt to carry out a stabbing, however, she was only moving forwards. In the Gaza Strip, on 09 September 2016, in excessive use of force, Israeli forces killed Abdul Rahman al-Dabagh (16) when they opened fire at dozens of youngsters, who headed to the border fence, southeast of al-Bureij refugee camp, and started throwing stones at Israeli soldiers. An Israeli soldier fired a flare bomb that directly hit the child, who was about 10-15 meters away from the fence. The bomb hit him right to his forehead, due to which he fell to the ground with his head on fire. The child was transported to al-Aqsa Hospital in Deir al-Balah, but few minutes after he was admitted to the hospital, the doctors pronounced him dead. On 16 September 2016, 2 Palestinian children were wounded in the same place and circumstances. In the context of Israeli forces targeting the border area, Israeli forces stationed at the border area, northeast of Jabalia, wounded a Palestinian farmer when they opened fire at a bird hunter and other farmers. It should be noted that the wounded farmer was about 400 meters to the west of the border fence. Concerning airstrikes, on 15 September 2016, Israeli warplanes carried out 3 airstrikes on the Gaza Strip. As a result, 2 agricultural rooms and a water well in al-Sayafa area were completely destroyed. In the context of targeting fishermen in the sea, on 17 September 2016, Israeli forces stationed in the northern Gaza Strip offshore opened fire at fishermen sailing within 2 nautical miles. As a result, the fishermen sailed back. Similar shooting was carried out in the same area at approximately 23:20 on Tuesday, 20 September 2016. On 19 September 2016, Israeli gunboats stationed northwest of Beit Lahia, north of the Gaza Strip, opened fire at Palestinian fishermen sailing in the area. As a result, Ahmed Zayed (32), from al-Salateen area in Beit Lahia village, sustained a bullet wound to the belly and his boat sustained damage. During the reporting period, Israeli forces conducted at least 116 military incursions into Palestinian communities in the West Bank and 11 ones in occupied East Jerusalem and its suburbs. During these incursions, Israeli forces arrested at least 110 Palestinian civilians, including 31 children and a woman. Thirty-three of them, including 12 children and the woman, were arrested in occupied Jerusalem. In the Gaza Strip, on 14 September 2016, Israeli forces moved about 100 meters to the east of al-Fukhari area, southeast of Khan Yunis, south of the Gaza Strip. They levelled lands for few hours after which they redeployed. On 20 September 2016, Israeli forces moved about 100 meters to the east of Khuza’a village, southeast of Khan Yunis, south of the Gaza Strip. They levelled lands also and then redeployed. Concerning house demolitions, on 16 September 2016, Murad Ja’abees self-demolished his own house in al-Sal’a neighbourhood in al-Mukaber Mount, southeast of East Jerusalem, in implementation of the Israeli municipality’s decision under the pretext of building without a license. On 20 September 2016, the Israeli municipality demolished a house belonging to the family of Hassan Alqam in Beit Hanina neighbourhood, north of occupied Jerusalem, under the pretext of building without a license as well. In the same context, Israeli forces demolished on the same day, agricultural facilities and barracks, south of the Old City, belonging to Nidal Mohammed Dabash. Regarding vacating Palestinian houses in favour of settlement organizations, on 15 September 2016, the Israeli authorities ordered the family of Mazen Qersh to leave their house in the Old City under the pretext the family is an “unprotected tenant” and it lost the protection because it is from the “fourth generation“. It should be noted that the family has lived in the house since 1936 according to a rental contract from a Palestinian family that owned the house before that family sold it to the settlers in 1986. On 10 September 2016, a group of settlers from ” Immanuel ” settlement set fire to lands of Palestinians in Jinsafout village, east of Qalqilya. The Civil Defence crews could not put fire out. As a result, 13 olive trees were burnt. At approximately 02:30, Israeli forces moved into Sureef village, northwest of Hebron. They raided and searched two houses belonging to Saif al-Deen Ali al-Hour (25) and Basam Rasem Ghunimat (22) and then arrested both of them. At approximately 03:30, Israeli forces moved into the southern area of Hebron and stationed near Jabir neighbourhood. They raided and searched a house belonging to Naji Mohamed al-Atrash. They withdrew later and no arrests were reported. At approximately 17:00, Israeli gunboats stationed offshore arrested 6 fishermen while sailing within 6 nautical miles off Deir al-Balah shore, in the center of the Gaza Strip. According to fisherman Abed al-Mo’ti Ramy al-Habeel (17), who was one of the arrested fishermen, at approximately 06:00, I headed along with the fishermen Mohamed Abed al-Mo’ti al-Habeel (25), Fayiz Ahmed Abu Foul (47), Abed al-Mo’ti Ibrahim al-Habeel (18) and Ali Ayman al-Habeel (17) to Gaza Seaport. The above-mentioned fishermen got on a fishing boat belonging to Abed al-Mo’ti’s grandfather and then sailed southwards and started throwing their fishing nets until they reached Rafah shore. When they came back to Deir al-Balah shore, they were surprised by 3 Israeli gunboats firing live bullets and rubber–coated metal bullets at them. As a result, the fishermen attempted to flee, but Israeli naval forces directly opened fire at the boat engine, so it stopped. Israeli naval forces then surrounded the fishermen and told them via loudspeakers to jump in the sea and swim towards the gunboats. When the fishermen climbed over the gunboat, Israeli soldiers handcuffed and blindfolded them and then took them to Ashdod Seaport. The fishermen were put in a room and then a doctor came and conducted medical examinations for them before they were questioned. Israeli officers asked the fishermen about their personal information and took several photos of them. They also took the name of the boat owner. At approximately 03:30 on Friday, 09 September 2016, the fishermen were cuffed again and taken by bus to Beit Hanoun “Erez” crossing. It should be noted that Israeli naval forces confiscated the fishing boat and fishing tools. At approximately 10:00, Israeli forces stationed along the border fence between the Gaza Strip and Israel, east of Abu Safia area, northeast of Jabalia refugee camp, north of the Gaza Strip, opened fire at bird hunters and farmers, who were in their fields. As a result, Mohamed Mousa Abu ‘Amsha (18), from Beit Hanoun, was hit with a live bullet to the left hand resulting in the amputation of his thumb. Mohamed was then taken to the Indonisian Hospital, where medical sources classified his wound as moderate. It should be noted that Mohamed was wounded when he was present about 400 meters to the west of the border fence. At approximately 11:00, Israeli forces arrested ‘Anan Abed al-Jaleel Ikhlail (21) and Mohamed Hasan ‘Adi (20), both from Beit Ummer village, north of Hebron. ‘Anan and Mohamed were arrested while heading the Israeli Intelligence Service in “Gosh Etzion” settlement, south of Bethlehem, due to summonses sent to him via cell phones. Note: During the aforementioned day, Israeli forces conducted (7) incursions in the following areas and no arrests were reported: Sa’ir, Dura and al-Koum villages and al-Fawar refugee camp in Hebron; and Masliya, Marka and Qabatia villages, south of Jenin. At approximately 15:10, Israeli forces moved into Hijah village, east of Qalqiliya. They raided a house belonging to Fahd Wael Masalha (23) and arrested him. Note: During the aforementioned day, Israeli forces conducted (4) incursions in the following areas and no arrests were reported: Beit Ummer and Samou’a villages in Hebron; and Kafur Qaddoum village, northeast of Qalqiliya. At approximately 01:30, Israeli forces moved into Hebron and stationed in Abu Katilah neighbourhood. They raided and searched two houses belonging to Abed al-Basit Ali Ghayth and Mohamed Nafiz al-Haymoni and arrested both of them. Around the same time, Israeli forces moved into Qabatia village, southeast of Jenin, and patrolled the area. A group of Palestinian civilians threw stones at Israeli forces, who heavily fired tear gas canisters at them and chased them. At approximately 05:00, Israeli forces arrested Aous Jamal Ameen Hamamdah (23) and then withdrew. Note: During the aforementioned day, Israeli forces conducted (3) incursions in the following areas and no arrests were reported: Tafouh, Beit Ola and Sureef villages in Hebron. At approximately 01:00, Israeli forces moved into Beit Fajjar village, south of Bethlehem. They raided and searched houses from which they arrested ‘Alaa Marwan ‘Isaa Taqatqah (23) and Abdullah Taqatqah (20). At approximately 03:00, Israeli forces moved into Sanour village, south of Jenin. They raided a house belonging to Mohamed Sidqy Jarar (55) and handed his two sons Tareq and Esam summonses to refer to the Israeli Intelligence Service in Salem camp, west of the city. After that, Israeli forces raided and searched a house belonging to Ziyad Sadiq Gharbiya (50). At approximately 04:00, they withdrew and no arrests were reported. At approximately 02:30, Israeli forces moved into Beit Rima village, northwest of Ramallah. They raided and searched a house belonging to Wahbi Ihssan Satouf al-Rimawi (26) and arrested him. At approximately 16:00, in the first day of Adha Eid, an Israeli infantry unit moved into al-Wa’ar area, east of Qasrah village, southeast of Nablus. A number of Palestinian civilians gathered and threw stones at Israeli forces that fired live bullets at them. As a result, 4 civilians were wounded and then taken to Rafidia Hospital in Nablus to receive medical treatment. PCHR keeps the names of the wounded persons. At approximately 02:30, Israeli forces moved into Beit Ummer village, north of Hebron, and stationed in al-Bayadah and ‘Ereq al-Latoun areas. They raided and searched two houses belonging to Omar Mohamed ‘Awad (16) and ‘Odai ‘Isaa al-Zakrawi (16) and arrested both of them. At approximately 07:30, Israeli forces accompanied with military vehicles moved about 100 meters to the east of al-Fukhary area, southeast of Khan Yunis, south of the Gaza Strip. Israeli vehicles patrolled the area for few hours before re-deploying along the border fence between the Gaza Strip and Israel. At approximately 15:50, Israeli forces moved into Mardah village, north of Salfit. Israeli vehicles patrolled the area and fired tear gas canisters at the stone-throwers. They also raided a toys shop and detained Baha Majid Khafash (17), who was released later. At approximately 17:10, Israeli forces moved again into the village, but neither house raids or arrests were reported. Note: During the aforementioned day, Israeli forces conducted (4) incursions in the following areas and no arrests were reported: Halhoul, Sa’ir and Beit Kahel villages in Hebron; and Hawarah village, south of Nablus. At approximately 01:00, Israeli forces moved into Sureef village, northwest of Hebron, and stationed in the centre of the village. They raided and searched two houses belonging to Ibrahim Ali Abu Farah (22) and Omar Ali al-Heih (25) and arrested both of them. At approximately 01:30, Israeli forces moved into Hebron and stationed in al-Shayikh neighbourhood. They raided and searched a house belonging to Abed al-Kareem Mahmoud al-Rajbi (38) and then arrested him. At approximately 02:00, Israeli forces moved into al-Doha village, west of Bethlehem. They raided and searched a number of houses and then handed Nader Essa al-Khateeb (25) a summons to refer to the Israeli Intelligence Service in “Gosh Etzion” settlement, south of the city. At approximately 03:25, Israeli warplanes fired 2 missiles at an open area, west of al-Shaymaa area, north of Beit Lahia, north of the Gaza Strip. The explosion caused fear among civilians, especially women and children, but no casualties were reported. At approximately 03:30, an Israeli warplane fired a missile at al-Yarmouk training site belonging to al-Qasam Brigades (armed wing of Hamas Movement), east of al-Shuja’iya neighbourhood, east of the Gaza Strip. No casualties were reported. At approximately 03:35, Israeli warplanes fired 3 missiles at a water well and two agricultural rooms located in a 90-square-meter plot of land belonging to Salem Hamad Mohamed Abu Shamas (41) in al-Sayfa area, west of Beit Lahia, north of the Gaza Strip. As a result, the water well and two agricultural rooms were completely destroyed. It should be noted that the abovementioned plot of land located about 800 meters away from the border fence between the Gaza Strip and Israel. At approximately 04:00, Israeli forces moved into Beit Sahour village. They raided and searched a house belonging to Ramzy Ahmed Khalaif (41) and arrested him. At approximately 15:00, Israeli forces moved into Bureen village and al-Sabi’ Mount, east of the village, south of Nablus. A number of Palestinian young men gathered and threw stones at Israeli forces, who fired live bullets and tear gas canisters in response. Moreover, Israeli forces arrested Rabei’ Abed al-Kareem Abed al-Hadi (14) and took him to an unknown destination. Note: During the aforementioned day, Israeli forces conducted (6) incursions in the following areas and no arrests were reported: Wadi al-Rashah and Ras al-Tirah villages, southeast of Qalqilyia; al-Am’ari refugee camp in al-Bireh; Sa’ir, Ethna and Bani Na’iem villages in Hebron. At approximately 02:00, Israeli forces moved into Yatta village, south of Hebron, and stationed in al-Deir area. They raided and searched a house belonging to Ali ‘Azam Nawaj’ah (18) and then arrested him. At approximately 12:30, Israeli forces stationed at the entrance to “Givat Kharsina” settlement, east of Hebron, opened fire at a private car claiming that it attempted to carry out a run-over attack. As a result, the car diver Feras Mousa Mohamed al-Khdour (17) was killed, while his relative Raghad Abdullah Abdullah al-Khdour (16), who was with him, sustained live bullet wounds. It should be noted that Feras and Raghad are from al-Birkah area in Bani Na’iem village, east of Hebron. In the meantime, Israeli forces declared the area as a closed military zone. The family was then informed that their daughter was taken to Hadassah Hospital in Jerusalem, while the victim’s corpse is still under the Israeli custody. At approximately 15:45, Israeli forces moved into Bitah village, southeast of Nablus. Israeli vehicles patrolled the area. A number of Palestinian young men gathered and threw stones at Israeli forces that fired live bullets and tear-gas canisters in response. Israeli forces arrested ‘Awad Hamad al-Jaghoub (15) and took him to an unknown destination. At approximately 17:00, Israeli forces stationed at Gilbert military checkpoint, north of Tal al-Rumidah neighbourhood, in the canter of Hebron, opened fire at “Mohamed al-Thalji” Mohamed Kaiyd Rajbi (15). As a result, Mohamed was immediately killed and was then taken by a military vehicle to an unknown destination. It should be noted that Mohamed is from Dowyirban neighbourhood in the western area of the city. Israeli forces claimed that Mohamed attempted to carry out a stabbing attack. They summoned his father at checkpoint (160) in the southern area of Hebron, where they informed him that his son was killed. At approximately 21:00, Israeli forces moved into ‘Ayida refugee camp, north of Bethlehem. They raided and searched a house belonging to Mamdouh As’ad Karajah (25) and then arrested him. Note: During the aforementioned day, Israeli forces conducted (8) incursions in the following areas and no arrests were reported: Kaful Hares village, northeast of Salfit; Kafur Qalil village, east of Nablus; Birzeit , north of Ramallah; al-Jalazoun refugee camp in the center of al-Bireh city; Bani Na’iem, Samou’a, Beit Ummer and al-Jalajil villages in Hebron. At approximately 00:30, Israeli forces moved into Yassouf village, east of Salfit. They raided and searched a house belonging to Abdullah Mit’ib Abed al-Fatah (24) and handed him a summons to refer to the Israeli Intelligence Service. After that, Israeli forces withdrew and no arrests were reported. At approximately 01:00, Israeli forces accompanied with military vehicles moved into Bani Na’iem village, east of Hebron. They raided and searched a house belonging to Yousef Mohamed al-Khdour (50), the uncle of Feras a-Khdour (17), who was killed at the entrance to “Givat Kharsina” settlement on 16 September 2016. After that, Israeli forces withdrew from the house and no arrests were reported. In the meanwhile, another force of Israeli soldiers raided two houses belonging to Murad Mohamed Abu Sakout (35) and Abed al-Rahman Khalid al-Tashli (28) and handed them summonses to refer to the Israeli Intelligence Service in “Gosh Etzion” Settlement, south of Bethlehem. At approximately 03:00, Israeli forces moved into Selwad village, northeast of Ramallah. They raided and searched a house belonging to Majdi Mahmoud Hamed and handed him a summons to refer to the Israeli Intelligence Service. At approximately 07:00, Israeli forces stationed in the closed area between al-Rahma Mount and Tal al-Rumaida neighbourhood, in the centre of Hebron, opened fire at Hatim Abed al-Hafiz Abed al-Raheem al-Shalodi (25), whose house is about 20 meters away from the scene. As a result, Hatim was immediately killed and his corpse was detained for 2 hours before it was transported by a military vehicle to an unknown destination. After that, Israeli Media published a video clip showing the above-mentioned civilian attacking an Israeli soldier with a sharp tool. Israeli authorities prevented the victim’s family from approaching the victim, but one of his brothers was able to identify him. It should be noted that Israeli forces closed the above-mentioned street for over 10 years with cement cubes and Israeli forces are usually stationed there to check the civilians’ IDs. At approximately 19:00, Israeli forces moved into ‘Araq Bureen village, south of Nablus. They raided and searched many houses from which they arrested 6 civilians, including 2 children. The arrested persons were identified as Jamil Raghdan Qadous (33), Hamada Kamal Qadous (16), Wajdi Nadir Qa’dan (19), Osama Waleed Qadous (22), Maher Dahshat Qadous (16) and Shalabi Saleem Mostafa Ramadan (22). At approximately 20:20, Israeli gunboats stationed offshore, northwest of Beit Lahia, north of the Gaza Strip, heavily opened fire at Palestinian fishing boats sailing within two nautical miles. As a result, fishermen were forced to flee for fear of being arrested or wounded. No casualties were reported. Note: During the aforementioned day, Israeli forces conducted (4) incursions in the following areas and no arrests were reported: Hijah village, east of Qalqilyia; al-Dahiryia and al-Shayyoukh villages in Hebron; and Sardah village, north of Ramallah. At approximately 01:30, Israeli forces moved into al-Dahiyia al-Tahta neighbourhood, southeast of Nablus. They raided and searched houses from which they arrested two brothers Ibrahim (20) and Mohamed Mahmoud Hamidan (19). At approximately 02:00, Israeli forces moved into the southern area of Hebron and stationed in al-Karantina neighbourhood and Dahiyat al-Baladiya. They raided and searched houses belonging to al-Shalodi, Abu Saninah, ‘Ashour and al-Karaki families and handed three civilians summonses to refer to the Israeli Intelligence Service in “Gosh Etzion” settlement, south of Bethlehem. The three summoned civilians were identified as Sha’ban Sulhub al-Tamimi, ‘Aliyan Mahmoud al-Shaloudi and Ibrahim Hamed Abu Saninah. Moreover, Israeli forces arrested two other civilians: Islam Fayiad Zahdah (35) and Suliman Ali Abu Turkey (29). At approximately 03:00, Israeli forces moved into Nour al-Shams camp, east of Tulkarm. They raided and searched a house belonging to Osama Mohamed Khalid Omar (18), who was not home, and handed his family a summons to refer to the Israeli Intelligence Service. At approximately 10:00, Osama went to the Israeli Intelligence Service and surrendered to them. At approximately 05:30, Israeli forces moved into Betouniya village, west of Ramallah. They raided and searched a house belonging to Salah al-Deen Mostafa Hamidah (45) and then arrested him. It should be noted that Salah al-Deen was nominated for local elections in the Betouniya independent list. At approximately 06:10, Israeli forces opened fire at Bahaa al-Deen Mohamed Khalil ‘Odah (20), claiming that he carried out a stabbing attack against an Israeli officer at the entrance of “Efrat” settlement, which is established in Khilat al-Nahlah village, south of Bethlehem. As a result, Bahaa al-Deen was hit with live bullets and was then taken to Soroka Hospital in Beersheba. Israeli sources stated that “Efrat” settlement guards said they noticed Bahaa al-Deen’s movement before approaching the settlement. Therefore, they warned the Israelis not to go out, but Bahaa al-Deen was able to sneak into the settlement based on his previous knowledge of the place the Israeli radio reported that Israeli forces observed a suspicious person wandering in “Efrat” settlement at approximately 02:00. The settlement guards attempted to find him, but he kept hiding until the morning, when he ambushed to an Israeli officer and stabbed him in his underarm. At approximately 10:00, Israeli forces arrested Loqman Ahmed Mohamed al-Sha’ir (19), from Sabastiya village, northwest of Nablus, after summoning him to the Israeli Intelligence Service in Hewarah detention center, southeast of the city. Israeli forces handed Loqman’s family a summons 3 days ago to refer to the Israeli Intelligence Service and when Loqman arrived, he was questioned and then arrested. Loqman is still under the Israeli custody. At approximately 19:00, Israeli forces moved into Zaboba village, west of Jenin. Israeli vehicles patrolled the area, during which, a number of Palestinian young men gathered and threw stones at Israeli vehicles. Israeli soldiers then fired live bullets, tear gas canisters and sound bombs in response. At approximately 01:00, the next day, Israeli forces arrested 4 civilians, including 3 children. The arrested persons were identified as Ziyad Abed al-Rahman Jaradat (25), Mohamed Karim Zayoud (16), Yazan Jamal Zaqzaq (15) and Nour Amjad ‘Obaidy (14). At approximately 05:30, Israeli forces released all the arrested persons. Note: During the aforementioned day, Israeli forces conducted (8) incursions in the following areas and no arrests were reported: Sabastiya village, northwest of Nablus; Balatah camp, east of the village; Abu al-‘Asajah and al-Koum villages and al-Fawar refugee camp in Hebron; Kafur al-Deek village, west of Salfit and Mardah village, north of the city. At approximately 01:00, Israeli forces moved into Balatah refugee camp, east of Nablus. They raided and searched a house belonging to Ahmed Talib Miskawi (17) and then arrested him. At approximately 01:30, Israeli forces moved into Tal village, southwest of Nablus. They raided and searched a house belonging to ‘Amr ‘Emad Yousef Abu Rihan (20) and arrested him. It should be noted that ‘Amr is a Law student at al-Najah National University in Nablus. At approximately 02:00, Israeli forces moved into Bethlehem and stationed in Wadi al-Ma’ali neighbourhood. They raided and searched a house belonging to Mohamed Shehada al-Ta’mary. Meantime, they barbarically assaulted his son “Ayat Allah” (19), so his mother, ‘Adalah Ibrahim al-Ta’miry (50) clashed with the soldier while attempting to defend her son. Israeli forces then confiscated NIS 130,000 and arrested Ayat Allah and his mother ‘Adalah. It should be noted that Mohamed Shehada al-Ta’mary was killed by Israeli undercover units in 2008 in the center of Bethlehem. In a new crime of excessive use of lethal force, Israeli forces killed 2 Palestinian civilians, including a child, near al-Ibrahimi mosque, south of the Old City in Hebron. According to PCHR’s investigations, at approximately 13:00, Israeli Border Guard officers stationed in a surveillance and search room in ‘Ain al-Hamrah area, south of al-Ibrahimi mosque, south of Hebron’s Old City in, opened fire at Amir Jamal Mohamed Rajbi (17) and Mohand Jameel Ahmed Rajbi (22). Amir and Mohand are from Khellet Manaa’ neighbourhood, southwest of Hebron. As a result, Amir was immediately killed, while Mohand sustained serious wounds. Mohand was then taken by an ambulance that arrived half an hour later. After an hour, Mohnad succumbed to his wounds. Israeli forces claimed that the two victims attempted to carry out a stabbing attack, but in real they did not pose any serious threat to the lives of Israeli soldiers. At approximately 19:15, Israeli gunboats stationed offshore, northwest of Beit Lahia, north of the Gaza Strip, opened fire at Palestinian fishing boats. As a result, Ahmed Mohamed Mohamed Zayid (32), from al-Salateen area in Beit Lahia, was hit with a live bullet to the abdomen, while his fishing boat sustained damage. According to field investigations, Israeli naval forces heavily fired live bullets at a fishing boat belonging to Zayid, who was along with another fisherman named Ahmed Shawqi Fawzi al-Sultan (22), sailing within 2 nautical miles. As a result, Zayid was wounded and his boat sustained damage. Meanwhile, Ahmed Sultan headed to the shore and called an ambulance to take Zayid to the Indonesian Hospital in Jabaliya refugee camp, where medical sources classified his wounds as serious. Zayid immediately underwent a surgery to extract shrapnel from his body. After that, Zayid medical condition was classified as stable. Note: During the aforementioned day, Israeli forces conducted (8) incursions in the following areas and no arrests were reported: Dora, Yatta, Halhoul Kharas, Beit Awwa, Ethna, Ruq’a and Tarama in Hebron. At approximately 01:00, Israeli forces moved into Nablus. They raided and searched houses and then arrested Omar Yaseen al-Shakhshir (22), who is a student at the Faculty of Engineering at An-Najah National University. Around the same time, Israeli forces moved into Salfit. They raided and searched a house belonging to Nazmi Saleem (20) and handed him a summons to refer to the Israeli Intelligence Service. No arrests were reported. At approximately 01:30, Israeli forces moved into ‘Askar camp, northeast of Nablus. They raided and searched houses and then arrested Mohamed Mostafa al-Zariqy (23). Around the same time, Israeli forces moved into Beit Fajjar village, south of Bethlehem. They raided and searched houses and then arrested Salama Mohamed Taqatqah (21). At approximately 02:00, Israeli forces moved into al-Dahisha refugee camp, south of Bethlehem. They raided and searched houses, during which, a number of Palestinian young men gathered and threw stones and Molotov cocktails at Israeli soldiers. After that, Israeli soldiers fired live bullets and rubber-coated metal bullets at them. As a result, a civilian was hit with a live bullet to the leg, while two other civilians were hit with rubber-coated metal bullets to the legs and face. The wounded were taken to Beit Jala Hospital to receive medical treatment. Moreover, Israeli forces arrested Ramzy Abu ‘Ajamyah (15) and Ahmed Mahmoud Fararjah (16). Around the same time, Israeli forces accompanied with 5 military vehicles moved into al-Dahiryia village, south of Hebron, and stationed near al-Dahiryia municipality. Israeli forces raided and searched a building consisting of 4 floors belonging to the heirs of Hisham Badir Abu ‘Alan’s. Other Israeli soldiers deployed in the main street, during which, a number of Palestinian young men gathered and threw stones at Israeli vehicles. Israeli soldiers then indiscriminately fired sound bombs and tear-gas canisters at them. No arrests were reported. At approximately 03:00, Israeli forces moved into Silet al-Harithiya village, west of Jenin. They raided and searched a house belonging to a journalist Mos’ab Qasem Zayoud (34), who works as a reporter at Doniya al-Watan Agency and Ramallah Mix as well. They confiscated Mos’ab’s cell phones and a memory. At approximately 05:30, Israeli forces arrested Mos’ab and then withdrew. Around the same time, Israeli forces moved into ‘Aiyda refugee camp, north of Bethlehem. They raided and searched two houses belonging to Yaseen Ma’moun Badir (17) and Ibrahim Mohamed Abu Souror (22) and arrested them. At approximately 03:10, Israeli forces moved into Kaful Hares village, north of Salfit. They raided and searched a house belonging to Ayman ‘Aziz Jabir (27) and arrested him. At approximately 03:30, Israeli forces moved into al-Doha village, west of Bethlehem. They raided and searched houses and then arrested Mohamed Faris Fararjah (19). Around the same time, Israeli forces moved into Qarawit Bani Zaid village, northwest of Ramallah. They raided and searched a house belonging to Zakir ‘Aziz ‘Arar (35) and then arrested him. At approximately 04:00, Israeli forces moved into al-Jalazoun refugee camp, north of Ramallah. They raided and searched houses from which they arrested 6 civilians, including 4 children. The arrested persons were identified as ‘Odai Majid Qatawi (18), ‘Odai Mostafa Nakhlah (17), Osama Mostafa al-Hatab (15), Ali Omar Othman Nakhlah (25), Mojahid Salah ‘Aliyan (16) and Yousef Sami Dar Mosleh (16). At approximately 04:30, Israeli forces moved into Bethlehem and stationed in al-Maslakh neighbourhood in the centre of the village. They raided and searched a number of houses and then handed Ibrahim ‘Ata al-Hiramy (28) a summons to refer to the Israeli Intelligence Service in “Gosh Etzion” settlement, south of the city. At approximately 07:00, Israeli forces accompanied with military vehicles moved about 100 meters to the east of Khuza’ah village, southeast of Khan Yunis, south of the Gaza Strip. Israeli vehicles patrolled the area for few hours before redeploying along the border fence between the Gaza Strip and Israel. In a new crime of excessive use of force, Israeli forces killed a Palestinian child at the entrance to Bani Na’im village, east of Hebron. According to PCHR’s investigations, at approximately 08:00, Israeli forces established a checkpoint at the entrance to Bani Na’im village in al-Joz Valley area, east of Hebron, after one day of removing piles of sand and rocks placed at the entrance. ‘Issa Salem Mahmoud Tarayrah (16) from the aforementioned village was walking to the checkpoint when the Israeli soldiers, without any prior warning, deployed on both sides of the road and 30 meters away opened fire at him. The child was wounded and left to bleed for half an hour before taking him from the area and announcing him dead. The Israeli soldiers claimed that Tarayrah had a knife and attempted to stab Israeli soldiers. There were no local eyewitnesses to confirm or refute the Israeli claims. At approximately 15:00, Israeli soldiers arrested Mohammed Sadeq al-Qawasmah (24) from al-Sheikh neighbourhood in Hebron’s Old City after severely beating him. This happened when he was near ‘Ali al-Bakka’ Mosque on Abu al-Humus Road in the city, where clashes broke out between stone-throwers and Israeli soldiers. The aforementioned civilian was taken to an unknown destination. At approximately 23:20, Israeli gunboats stationed off al-Wahah Shore, northwest of Beit Lahia in the northern Gaza Strip, heavily opened fire at Palestinian fishing boats sailing within 2 nautical miles and chased them. As a result, fishermen fled away for fear of being wounded or arrested. However, no casualties or damages to the boats were reported. Note: During the aforementioned day, Israeli forces conducted (6) incursions in the following areas and no arrests were reported: Bitounia village, west of Ramallah; Kafr al-Deek village, west of Salfit; Howarah village, south of Nablus; al-Heryah Valley neighborhoods in the southern area of Hebron and villages of al-Zawiyah Gate, Sorif, Sa’ir and Beit Ummar in Hebron. At approximately 01:00, Israeli forces moved into Beit Ummar village, north of Hebron, and stationed in the centre of the village. They raided and searched a number of houses, from which 3 civilians, includling a child, were arrested. The arrested civilians were identified as Mo’ataz Mohammed Ahmed Akhlil (27); Mohammed ‘Issa Mohammed Bahar (17) and Muhanad Zuhair al-‘Allami (18). The Israeli soldiers also handed Fadi Mohammed Fawzan al-Ja’ar (16) a summons to refer to the Israeli Intelligence in “Gosh ‘Etzion” settlement, south of Bethlehem. Around the same time, Israeli forces moved into Dura, southwest of Hebron. They stationed in Haninah area and then raided and searched a house belonging to ‘Ali Mohammed ‘Amer (22). They arrested the aforementioned civilians and later withdrew taking him to an unknown destination. At approximately 01:30, Israeli forces backed by two military vehicles and an armoured personnel carrier moved into Kafr al-Deek, west of Salfit. They raided and searched a house belonging to ‘Ammar Nayef Ahmed al-Deek (50). They arrested the aforementioned civilian and later withdrew taking him to an unknown destination. Around the same time, Israeli forces moved into the southern area of Hebron and stationed in Jabal Johar area. They raided and searched a number of houses belonging to Mohammed Shanan Rajabi, rohi ‘Abdel Shakour al-Atrash and Nabil ‘Ali al-Rajabi. They arrested ‘Abdel Rahman ‘Abdel Qader Soboh (33) and later withdrew taking him to an unknown destination. At approximately 02:00, Israeli forces moved into Burin village, south of Nablus. They raided and searched a number of houses and arrested ‘Abdullah Harbi Mustafa ‘Omran (23). They later withdrew taking him to an unknown destination. At approximately 02:30, Israeli forces moved into al-‘Aroub refugee camp, north of Hebron. They raided and searched a house belonging to Mohammed Yousif Jawabrah (22). They arrested the aforementioned civilian and later withdrew taking him to an unknown destination. At approximately 07:00, Israeli forces stationed at Jaljoulia checkpoint opened fire at Bara’ah Ramadan Hamed ‘Aweisi (13) from Qalqilya. As a result, she was hit with a bullet to her foot and immediately arrested. The wounded child is an UNRWA School student and was walking in the area without obeying the israeli soldiers orders to stand still. The Israeli media confirmed that ‘Aweisi did not carry out a stab attack but was just walking forward. Following the Friday prayer, on 09 September 2016, Palestinian civilians and Israeli and international human rights defenders organized protests in Bil’in and Ni’lin villages, west of Ramallah; al-Nabi Saleh village, northwest of the city and Kufor Qaddoum village, northeast of Qalqiliya. Israeli forces forcibly dispersed the protests, firing live and rubber-coated metal bullets, tear gas canisters and sound bombs. They also chased protesters into olive fields and houses. As a result, some of the protesters suffered tear gas inhalation while others sustained bruises as Israeli soldiers beat them up. Following the Friday prayer, on 16 September 2016, Palestinian civilians and Israeli and international human rights defenders organized protests in Bil’in and Ni’lin villages, west of Ramallah; al-Nabi Saleh village, northwest of the city and Kufor Qaddoum village, northeast of Qalqiliya. Israeli forces forcibly dispersed the protests, firing live and rubber-coated metal bullets, tear gas canisters and sound bombs. They also chased protesters into olive fields and houses. As a result, some of the protesters suffered tear gas inhalation while others sustained bruises as Israeli soldiers beat them up. At approximately 02:00 on Friday, 09 September 2016, dozens of Palestinian children and youngsters headed to the border fence between Israel and the Gaza Strip, southeast of al-Bureij (Um Hasaniyah Hill area) and threw stones at the Israeli soldiers, who in response opened fire at them and fired tear gas canisters. The clashes continued between the Israeli soldiers and youngsters till 19:00 when an Israeli soldier fired a flare bomb at ‘Abdel Rahman Ahmed ‘Abdel Qader al-Dabagh (16), who was around 15 meters away from the border fence. As a result, he was wounded to the forehead and fell to the ground while his head was on fire. Only minutes later, one of the youngsters carried him to a PRCS ambulance, which drove him to al-Aqsa Martyrs Hospital. Around minutes later, the hospital pronounced him dead due to being directly hit with a flare bomb to the head, causing him severe bleeding, fractures in the skull bones and laceration in the brain. Fayeq Yousif al-Maqadmah (17) from Khan Younis was wounded with a bullet to the left thigh. On Friday, 09 September 2016, Israeli forces allowed 228 persons; on Monday, 12 September 2016, one person; on Tuesday, 16 September 2016, 130 persons; on Wednesday, 13 September 2016, 117 persons and on Friday, 16 September 2016, 223 persons from the Gaza Strip to perform prayers in al-Aqsa Mosque in Jerusalem. On Thursday, 08 September 2016, Israeli forces allowed 3 persons to renew their permits. At approximately 17:00 on Monday, 19 September 2016, Israeli forces stationed at Beit Hanoun “Erez” crossing, north of the Gaza Strip, arrested Alaa’ Hasan Rajab Hamadah (47) from al-Tuffah neighborhood while he was on his way back to the Gaza Strip via Beit Hanoun crossing. It should be noted that Hamadah works in cars spare parts trading and leaves Gaza constantly through the Erez crossing. Hebron: Israeli forces established (27) checkpoints all over the city. On Thursday, 08 September 2016, Israeli forces established 4 checkpoints at the entrances to Bani Na’im, Kharsa, Oyoun Abu Saif villages and Farsh al-Hawa road. On Friday, 09 September 2016, Israeli forces established 2 checkpoints at the entrance to Taramah village and the northern entrance to Yatta. On Saturday, 10 September 2016, Israeli forces established 2 checkpoints at the entrances to al-Thaheriyah and Deir Samet villages. On Wednesday, 14 September 2016, Israeli forces established 2 checkpoints at the entrances to al-Aroub refugee camp and Beit Omar village. The On Thursday, 15 September 2016, Israeli forces established 4 checkpoints at the northern entrance to Hebron, the southern entrance to Halhoul, Kharsa and al-Samou’ villages. Following the death of child Mohammed Thalji Rajbi on Friday, 16 September 2016, Israeli forces closed all entrances to al-Ramedah Hill neighbourhood and the entrance to al-Shuhadaa’ Street in the centre of Hebron. They also prevented civilians to enter via “Gilbert” checkpoint and the entrance to al-Shuhadaa’ (56) Street and announced the area as closed military zone. Israeli forces also closed Wad al-Jawz road, which is the entrance to Bani Na’im village that lead to the bypass line (60) with cement cubes and sand barriers. As a result, civilians had to walk through a bumpy road to enter and leave the village. On the abovementioned day, Israeli forces established 3 checkpoints at southern entrance to Hebron, Kharsa village and southern entrance to Halhoul. On Saturday, 17 September 2016, Israeli forces established 3 checkpoints at the entrances to Ethna, Beit Oula and al-Mawreq villages. They also established 3 checkpoints at the entrances to Beit Ommar and al-Surra villages and al-Aroub refugee camp. On Monday, 19 September 2016, Israeli forces established 5 checkpoints at the entrance to Surif village, the entrance to Abu al-‘Asja village, Abu Saif Road, al-Hawouz area and the entrance to al-Fahes village, south of Hebron. On Tuesday, 20 September 2016, Israeli forces established 3 checkpoints at the entrances to Kharsa and Bani Na’im villages and al-Fawar refugee camp. At approximately 23:30 on Saturday, 11 September 2016, Israeli forces established a checkpoint at the entrance to al-Nabi Saleh village, northwest of Ramallah. At approximately 00:30 on Monday, 12 September 2016, Israeli forces established a checkpoint at the main street that leads to al-Jalazoun refugee camp near “Beit Eil” settlement, north of Ramallah. At approximately 02:30, they established a checkpoint near Attarah village, north of Birzeit. On Wednesday, 14 September 2016, Israeli forces established a checkpoint at the intersection of Ein Senia village, north of Ramallah. On Saturday, 17 September 2016, Israeli forces established 2 checkpoints near the bridge of Atarah village, north of Birziet village and the intersection of Ein Senia village, north of Ramallah. On Sunday, 18 September 2016, Israeli forces established 2 checkpoints in Oyoun al-Haramiyah area (on Ramallah- Nablus main Road) and near the bridge of Atarah village. At approximately 13:00 on Sunday, 11 September 2016, Israeli forces established a checkpoint at Nablus – al-Bathan Road, northeast of Nablus. At approximately 12:00 on Wednesday, 14 September 2016, Israeli forces established a similar checkpoint at Nablus – Rujib Road, east of the city. At approximately 17:00 on Thursday, 15 September 2016, Israeli forces stationed at Hawarah checkpoint, south of Nablus, closed the checkpoint and did not allow Palestinian civilians to cross the abovementioned checkpoint until late at night. The civilians were forced to pass through sand and rough road. At approximately 20:30 on Monday, 19 September 2016, after the Israeli forces announced that a bus for settlers was exposed to gunshots at Hawarah- Nablus Road, they closed Za’tarah and Hawarah checkpoints, south of Nabllus and prevented civilians and their cars from passing through them until late night. As a result, civilians had to go through a sand and bumpy road in order to reach their villages and houses. The Israeli forces closed Yitzhar bypass road, south of the city. At approximately 22:00, Israeli forces closed again main and sub-roads with sand barriers and cement cubes in the vicinity of Hawarah village, which was reopened in the first days of al-Adha Eid on 12 September 2016, with sand barriers for more than two weeks. The roads that were closed are: the entrance to Beta branching from Ramallah – Nablus Street; the road linking between Hawarah and Beta villages, northeast of Hawarah village; Ein Abus- Hawarah road branching from the main street of Hawarah village; Awdala- ‘Ourta road and Bier Kuza branching road that leads to schools and Hawarah village. At approximately 13:00 on Tuesday, 20 September 2016, Israeli forces closed the entrances and exits of ‘Aqraba village, south of Nablus, via sand barriers and cement cubes. They closed the main entrance to the village, which is a sub road of Za’tarah –Jericho Street. They also closed the south-western entrance that passes through Beta village and the south-eastern entrance, which is a sub- road that passes through Osarin village. However, they left a sub-road that passes through al-Majdal village, which needs a long time to be reached for the Palestinian villages and cities. On Tuesday, 13 September 2016, Israeli forces established 2 checkpoints at the entrance to ‘Asalah village and the eastern entrance to Qalqiliyah. At approximately 17:10 on Sunday, 18 September 2016, Israeli forces established a checkpoint at the entrance to Azoun village, east of Qalqiliyah. on Monday, 19 September, Israeli forces established 4 checkpoints at the entrances to Hejah, Ematin and Azoun villages, east of Qalqiliyah and Kafer Qadoum village, northeast of the city. The soldiers detained 7 civilians, including 4 children and military officer in the Palestinian National Security Forces. The detained civilians were identified as Meqdad Riyad al-Ashqar (17), Mohammed Emad Eshtiwi (17), Saber Anees Eshtiwi (17), Abdullah Akram Ali (17), military officer Akram Abdul Kareem Eshtiwi, Mohammed Basem Barham, Abdullah Maher Eshtiwi. The Israeli forces released the detained civilians and removed the checkpoint, and no arrests were reported. Salfit: Israeli forces established (9) checkpoints all over the city. On Thursday, 08 September 2016, Israeli forces established 2 checkpoints under the bridge of Eskakah village, east of Salfit and between Salfit and Bruqin village, west of the city. At approximately 12:40 on Saturday, 10 September 2016, Israeli forces established a checkpoint at the entrance to Yasuf village, east of the Salfit. At approximately 17:30 on Monday, 12 September 2016, they established a similar checkpoint at the entrance to Bruqin village, east of Salfit. At approximately 23:20 on Tuesday, 13 September 2016, Israeli forces established a checkpoint at the entrance to Bruqin village, west of Salfit. At approximately 18:30 on Thursday, 15 September 2016, Israeli forces established a checkpoint at the entrances to al-Zawiyah village, west of Salfit. At approximately 20:00 on Friday, 16 September 2016, they re-established the checkpoint in the abovementioned area. At approximately 08:00 on Monday, 19 September 2016, Israeli forces established 2 checkpoints at the entrance to Marada village, north of Salfit and the entrance to Deir Balout village, west of the city. Jericho: Israeli forces established (4) checkpoints all over the city. At approximately 18:40 on Friday, 16 September 2016, Israeli forces established a checkpoint at the northern entrance to Jericho. They searched the cars and checked the civilians ID cards. On Wednesday, 14 September 2016, Israeli forces established a checkpoint at the southern entrance to Jericho. At approximately 18:30 on Saturday, 17 September 2016, Israeli forces established a checkpoint at the southern entrance to Jericho. They searched the cars and checked the passengers ID cards. They also detained Mohammed Ahmed Maharmah (13) and forced him to take off his clothes claiming to find 2 Molotov cocktails and released him at approximately 00:20. At approximately 19:40, the Israeli forces established a checkpoint at the northern entrance to the city. At approximately 15:00 on Friday, 09 September 2016, Israeli forces stationed at al-‘Aroub refugee camp, north of Hebron, arrested Mohammed Khaled Halaiqah (25) from al-Shayuokh village, north of the city. At approximately 16:40 on Tuesday, 13 September 2016, Israeli forces established a checkpoint at the entrance to Azoun village, east of Qalqiliyah. They checked the civilians ID cards and their vehicles and then arrested Yusuf Basim Shabitah (19). At approximately 12:00 on Sunday, 18 September 2016, Israeli forces arrested Saud Faisal Thawabtah (26) when was present at the western entrance to Beit Fajjar village, south of Bethlehem. At approximately 12:00, Israeli forces stationed at a checkpoint near “Shavei Shomron” settlement, northwest of Nablus, arrested a Palestinian girl claiming that she attempted to carry out a stab attack near the above-mentioned settlement. The arrested girl was identified as Wafaa’ Saeed Mohammed Awad (19) from Awarta village, southeast of the city. On Friday, 16 September 2016, Israeli forces opened fire at a Jordanian young man while he was in al-Amoud Gate area in the Old City in East Jerusalem. They claimed that the young man attempted to stab an Israeli soldier. As a result, the young man was hit with more than 8 live bullets to his chest and neck and immediately died. According to investigations conducted by a PCHR’s fieldworker and statements of eyewitnesses, at approximately 11:50, when Saed Hayel al-‘Amru (28), who came from al-Kark Jordanian city to Jerusalem along with a tour group a day ago, was leaving the Old City in East Jerusalem via al-‘Amoud Gate, he approached a group of soldiers stationed at the abovementioned Gate and said: “Allah is great”. After that, the soldiers opened fire at him. As a result, Saed was hit with more than 8 live bullets to his chest and neck and died on the spot. It should be noted that Saed was born in al-‘Amru village, north of al-Kark Jordanian city and worked in the Water Authority. He was in a tourist visit to Jerusalem along with a tour group that entered the oPt via King Husian Bridge. At approximately 07:40 on Monday, 19 September 2016, Israeli forces opened fire at Ayman Hasan Mohammed al-Kurd (20) after he stabbed 2 Israeli police officers in al-Saherah Gate area in East Jerusalem. As a result, Ayman was hit with several live bullets after which he was arrested and taken to Hadassah Hospital to receive medical treatment. Few hours later, Israeli forces and members of the Intelligence Services raided and searched Ayman’s house in Ras al-Amoud area, east of the Old City. They then arrested his brothers, Alaa’ and ‘Ammar, to question them. Luba al-Samri, Spokesperson of the Israeli police, said in a statement that : a Jerusalemite young man in his twenties from al-Amoud Gate followed 2 police officers walking to Salah Eiden Police Centre. When he approached them, he stabbed them several times to the upper part of their bodies. An police officer then fired live bullets at him causing him sever wounds. At approximately 02:00 on Thursday, 08 September 2016, Israeli forces moved into al-Isawiyah village, northeast of Jerusalem. They raided a number of houses after which they arrested Adam Shafiq Obaid (16), Shadi Muhaisin (21) and Hamid Muhaaisin (23). At approximately 04:00, Israeli forces moved into al-Salam Suburb area in ‘Anata village, northeast of Jerusalem. They raided and searched a number of houses belonging to al-Julani family in the area. They then arrested 3 civilians namely Eyad Rubin Julani (40), Mohammed Rubin Julani (35) and Mohammed Fawaz Julani (24). At approximately 21:00 on Friday, 16 September 2016, Israeli Special Forces moved into Ein al-Lawzah neighbourhood in Silwan village, south of Jerusalem’s Old City. They deployed in the neighbourhood streets and stopped and searched the cars. During that, dozens of Palestinians closed the neighbourhood streets and threw empty bottles and fireworks at the Israeli soldiers, who immediately fired live bullets, rubber-coated metal bullets, tear gas canisters and sound bombs at them in response. As a result, dozens of inhabitants suffered gas inhalation due to the excessive use of tear gas canisters. 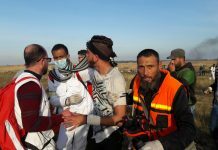 Among the wounded persons was Saeed Ahmed Abu Dyab (3), who was taken to Hadassah al-Isawiyah Hospital where he still receives medical treatment due to suffering from lack of Oxygen. Khawlah Hadiyah (52) also was taken to Hadassah Hospital to receive medical treatment. At approximately 16:00 on Sunday, 11 September 2016, Israeli forces moved into Wadi Helweh neighbourhood in Silwan village, south of Jerusalem’s Old City. They raided and searched a number of houses belonging to Siyam family in the neighbourhood. They then arrested Ali Ashraf Siyam (16) and Yazan Siyam (20) after they beat the family members and pepper-sprayed them. At approximately 22:00, Israeli forces moved into al-Isawiyah village, northeast of Jerusalem. They raided and searched a house belonging to the family of Ghadeb Obaid. They then arrested his 2 sons, Akram (12) and Mohammed (22) who suffers fractures in his foot. At approximately 07:00 on Sunday, 18 September 2016, Israeli forces moved into Ras al-‘Amoud neighbourhood, east of Jerusalem’s Old City. They raided and searched a house belonging to ‘Amr Bassam Abu ‘Arafah (29) and then arrested him. At approximately 01:00 on Monday, 19 September 2016, Israeli forces moved into al-Isawiyah village, northeast of East Jerusalem. They raided and searched a number of houses after which they arrested Hadi Ahmed Hassan (14) and Nasim Raed Kalib (16). At approximately 02:00, Israeli forces moved into Silwan village, south of the Old city in East Jerusalem. They raided and searched a house belonging to Feras Barqan. They then arrested his son Ashraf (15). At approximately 16:00, Israeli forces raided and searched a house belonging to Awsha’a Anwar Mona in the Old City in East Jerusalem. They confiscated some contents of the house and then arrested Awsha’a’s son, Mahmud (20). At approximately 02:00 on Thursday, 20 September 2016, Israeli forces moved into al-Isawiyah village, northeast of East Jerusalem. They raided and searched a number of houses and then arrested 11 civilians, including 5 children (PCHR keeps the name of the arrested civilians). At approximately 21:40 on Friday, 10 September 2016, a group of settlers from “Emmanuel” settlement set civilian lands on fire in Jinsafut village, east of Qalqiliyah. The Civil Defence crews could not extinguish the fire, burning 13 olive trees in Khaled Valleys area (Qana Valley Road) belonging to Eid Mohammed Eid, Eid Abdul Ghafer Atta Sabrah and Abdullah Mustafa Abdullah. It should be noted that settlers carried out several attacks in the same area, especially in the olive harvest season. At approximately 22:00 on Tuesday, 20 September 2016, dozens of settlers under the protection of the Israeli soldiers moved into Sebastia village, northwest of Nablus. Settlers gathered in an archaeological site in al-Bayader yard where they performed Talmudic rituals. In the same time, dozens of young men gathered and threw stones at the Israeli soldiers, who immediately fired live bullets, sound bombs and tear gas canisters at them in response. Later, settlers and Israeli forces withdrew, but neither casualties nor arrests were reported. At approximately 09:00 on Thursday, 15 September 2016, Israeli authorities forced family of Mazen Qersh to vacate their house in the Old City in East Jerusalem, claiming that the family is “a non- protected tenant” after he had lost protection for being the “fourth generation”. According to investigations conducted by a PCHR’s fieldworker, Israeli forces accompanied with crews from Israeli “Ateret Cohanim” Organization raided the house and forced the family comprised of 8 members, including a 3-year-old child and 2-month baby, to leave the property allowing them to even take their personal belongings and furniture. Mazen said that settlers, who came along with the crews of the abovementioned organization, vacated and confiscated the house contents and destroyed them. He also said that the Israeli court imposed a fine of NIS 270,000 (as rent for Ateret Cohanim organization and lawyer’s fees). Mazen added that he and his family have lived in the house since 1936 with a leasing contract from a Palestinian family that owned the property before it was sold to settlers in 1986. According to the Israeli law, the family is considered a “protected tenant” for three generations and they are: Mustafa Qirresh (grandfather) and his sons (Kamal and Harbi and their wives) while the sons of Kamal and Harbi are considered a fourth generation and the protection ended after the last person from the third generation died (Kamal’s wife). Qersh said that pointed out that the first eviction case was filed against his family in 1998 but Ateerat Cohanim was not able to vacate them because his mother was still alive and was considered a protected tenant (3rd generation). After she passed away in 2009, the settlement organization renewed its request to evacuate the family from the property. Qersh also said that the family presented a leasing contract in 1998 that was between his father Kamal Qirresh and the Palestinian family that owned the property. The Magistrate Court approved the contract which makes Kamal, his wife and children considered as protected tenants but the District Court then annulled the decision of the Magistrate Court and started asking for the property once again after the death of Itidal Qersh. The Magistrate Court issued a decision that Qirresh family vacate their property and was ratified by the District Court last May while the Supreme Court refused the appeal submitted by the family’s lawyer. It should be mentioned that the Ateerat Cohanim Organization seized a large part of the property of Qersh family in 2010 and the property where Mazen and his family of 8 individuals live was only left. On Friday evening, 16 September 2016, Morad Ja’abis self-demolished his house located in al-Sal’ah neighbourhood in al-Mukaber Mount village, southeast of East Jerusalem, due to the Israeli municipality decision under the pretext of building without a licence. Morad said to PCHR’s fieldworker that he self-demolished his house according to the municipality decision under the pretext of building without a licence. He mentioned that his 100-square-meter house built 11 years ago is comprised of four rooms, where he and his family comprised of 8 members live (the parents and 6 children the eldest of whom is aged 16 years while the youngest is 5 years). He added that during the past years, he paid construction fines of around NIS 100,000 as he tried to obtain a building licence, but in vain. Morad also said that the Israeli forces arrested him two weeks ago at a checkpoint in Ras al-‘Amoud area. They claimed he did not attend the Israeli Municipality session that was held in last July. Moreover, the municipality forced him to pay a bill of around NIS 1800 to attend the session scheduled at the end of this year. Morad said that the municipality will impose a new fine on him if he did not self-demolished his house in addition to paying the demolition costs for the municipality crews that are around NIS 80,000. On Monday evening, 19 September 2016, Suhair Abu Ermeilah self-demolished her grocery shop in al-Thawri neighbourhood, south of the Old City in East Jerusalem in implementation of the decision of the Israeli municipality under the pretext of building without a licence. Suhair said to PCHR’s fieldworker that she built the 40-square-meter grocery shop two years ago after the Palestinian Agricultural Relief funded her project to improve her economic condition. She said she was surprised with the demolition notice, but she continued working in the shop. However, the municipality raided the area several times to take photos and hand fines. Suhair said that the municipality will cause damage to the neighbouring residents during the demolition if she did not implement the demolition by herself in addition to paying a financial fine. She mentioned that during the past days she and her family lived difficult conditions such as losing the goods and vacating them to implement the demolition. In the same context, the Israeli municipality handed a demolition notice to a 60-square-meter house belonging to ‘Anad Abu Ermeilah from the same neighbourhood under the pretext of building without a licence. Anad’s daughter, Razan, said to PCHR’s fieldworker that she rented the house from her father to shelter her family comprised of 3 children. She was surprised when the municipality handed her the demolition notice in her and her father’s names. She pointed that the Israeli forces are after her and prevent her from working and travelling. At approximately 11:00 on Tuesday, 20 September 2016, Israeli municipality crews demolished a house belonging to Hasan ‘Alqam in Beit Hanenah neighbourhood, north of Jerusalem, under the pretext of building without a licence. Hasan said to a PCHR fieldworker that he was surprised when the Israeli forces surrounded the house and forced him and his family to leave it without vacating any of the furniture. They then began demolishing the house. He also said that he has paid construction fines of around NIS 90,000 imposed by al-Quds Israeli municipality for a year as he pays monthly around NIS 1500. It should be mentioned that Hasan ‘Alqam used to live in the 100-square-meter house with his wife and 2 children for a year and half. In the same context, Israeli forces demolished agricultural facilities and barracks in the area between Ghazayel neighbourhood and al-Hums Valley in Sour Baher village, south of Jerusalem’s Old City, belonging to Mohammed Dabash. They closed the area, prevented civilians from reaching it and levelled other lands in the same area.